I’ve actually been doing a lot of sewing lately, but with some for pattern testing, some for a future blog tour, and some for Christmas presents, there’s not much to show you yet… but it’s coming! 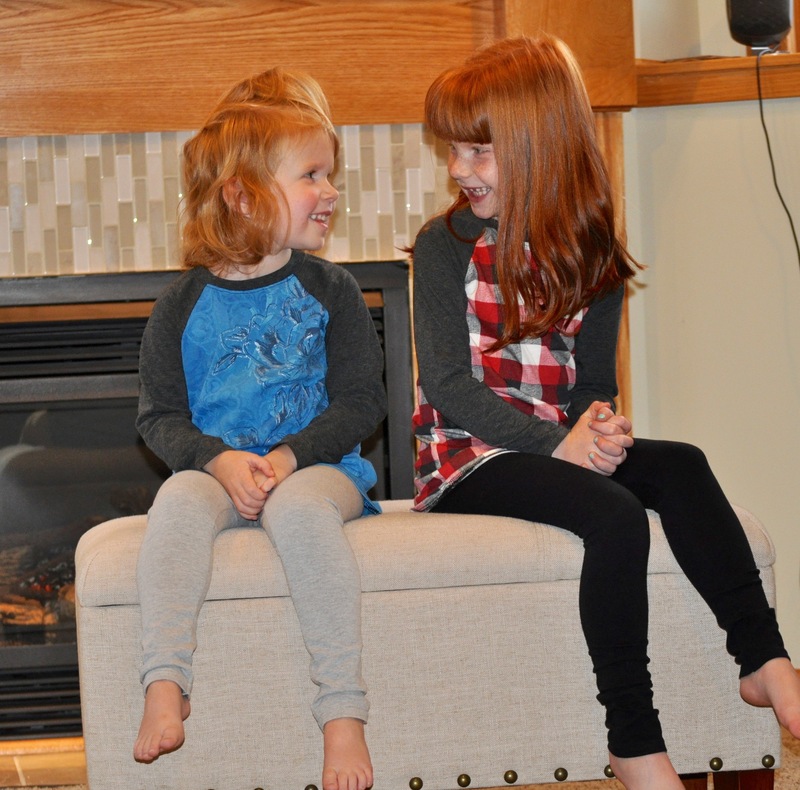 I received both of these fabrics in a french terry mystery box I bought from Raspberry Creek Fabric in early October, and I knew immediately that they would be something for Ella, and most likely a Bimaa. Then, when Tami posted about making the Bimaa into a dress for her daughter, I knew that’s what this was going to be, too. I’ve had the Bimaa pattern printed out and put together for a while now (and I’ve used it for some of those secret things I’ve been doing!). So… last night after the kids were in bed (roughly 7:42pm), I traced out the size I needed (3T), adding some length and a bit of a flare out for the dress modification, and cut my fabric. Can I tell you about these fabrics for a minute? Because they’re just about my favorite thing ever. Tim laughs at me every time I sew with french terry because I keep hugging the fabric, rubbing it against my cheek, and forcing him to “feel how soft it is!” And then, to try and throw the scraps away… I mean… talk about torture. Ella loves it too, and why not? It’s like wearing your favorite, cozy sweatshirt, but looking good and ready for church! Aside from a couple of random pieces, I’ve gotten all of my french terry from Raspberry Creek Fabric. It’s a small, independently run fabric shop on Etsy. There’s also a Facebook group run by the owner, where everyone can share what they’ve made with the fabrics from that shop. It’s pretty inspiring! That facebook group has also somehow attracted the most supportive group of people – so if you’re into sewing, go check it out! As someone who doesn’t have any family or friends that are as crazy about sewing as I am, it’s a place that I can “hang out” with my sewing community, and it’s pretty fun. Note – I’m not financially associated with them in any way (other than when I spend my entire fabric budget there sometimes!) – I just wanted to share in case you’re like me and want to find a great online sewing community! 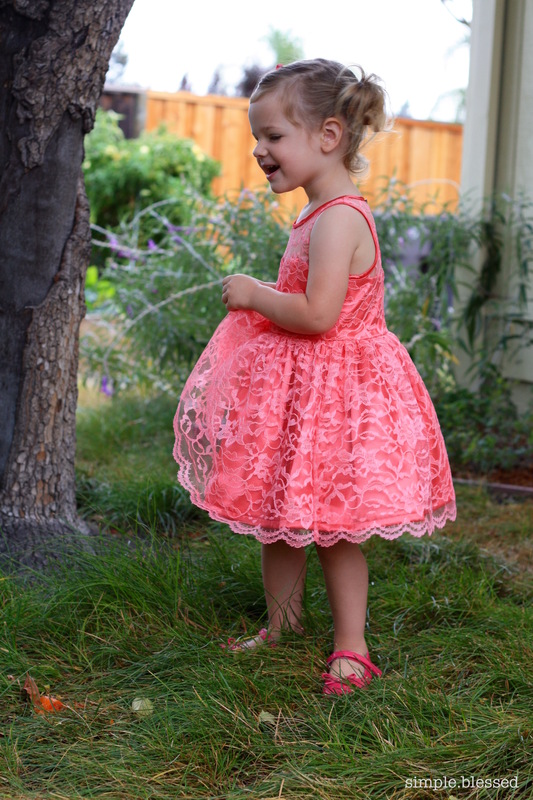 Okay – tangent over – now just a couple more pics of this crazy cute girl! *Marked items are affiliate links, and I will receive a small amount of compensation if you buy something after clicking on that link. Thanks for your support! While my family in the midwest is getting their first big snow of the year, it’s still feeling like fall here in California. 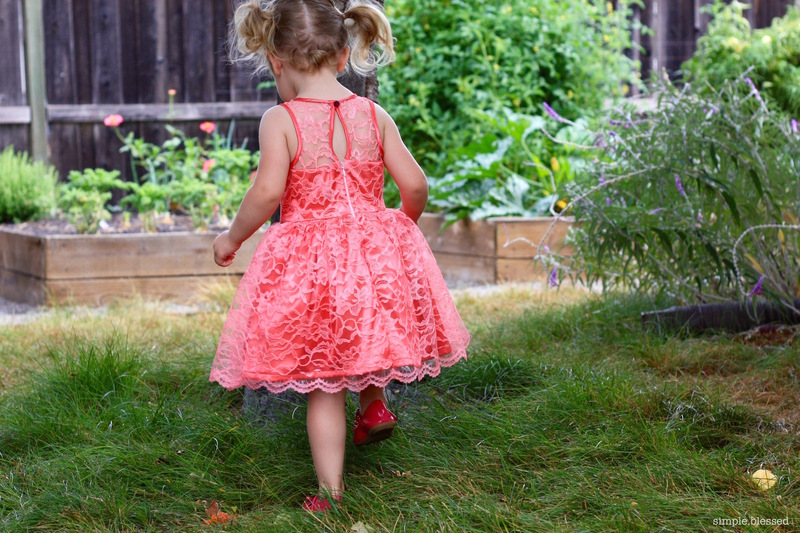 I thought it was about time I shared one of Ella’s most-worn dresses of this past summer. 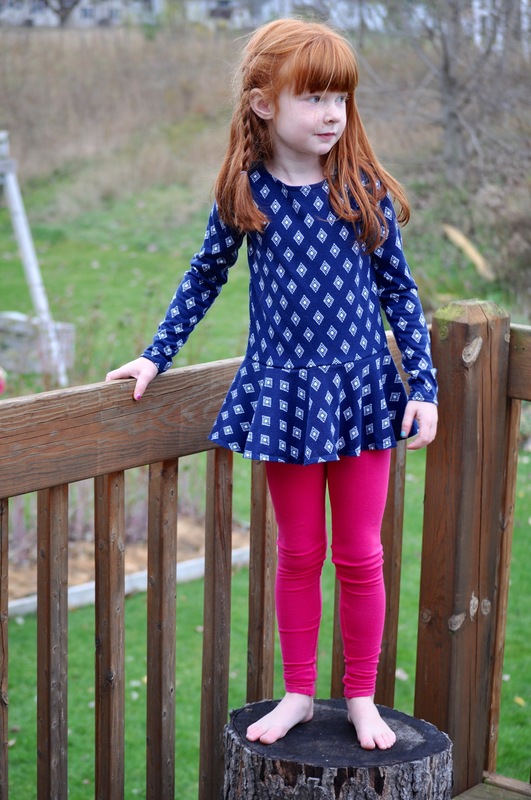 This dress is the McKenzie Tunic from Shwin Designs, lengthened to dress. I love, love this dress on Ella. It doesn’t have any closures, so it just slips right over her head, but it somehow also manages to stay on her shoulders without slipping off. It’s light and comfortable for her to wear. I picked up both of these fabrics on a trip to Michigan in the summer of 2014, at Field’s Fabrics in Jenison. The pink is a quilting cotton, and the blue is a lightweight chambray. Since we both loved the dress so much, she got a tunic length version as well. The gold heart material is a quilting cotton from Joann, and it’s adorable!!! I picked up the aqua material at FabMo. It’s more lightweight and less stiff than quilting cotton, so this turned out nice and flowy. 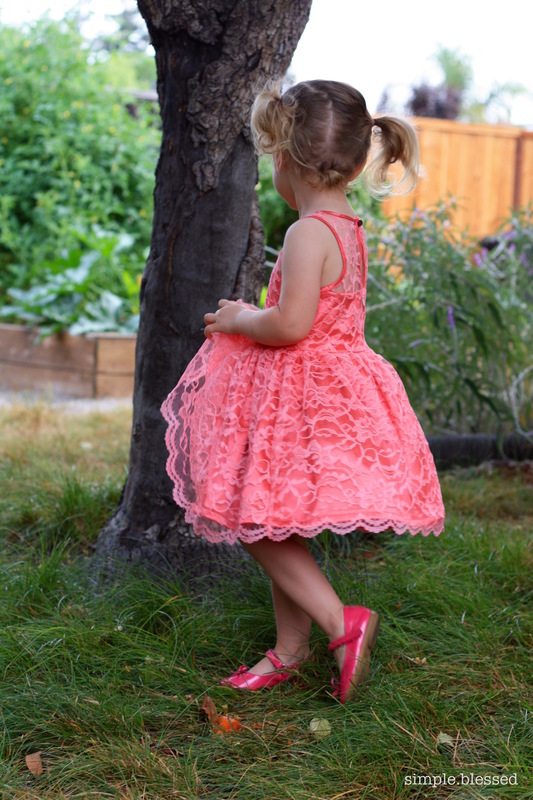 Flower Girl Dress – Trial Run! I searched for a pattern to use for this style, but couldn’t find anything that was exactly what I was looking for, so I ended up hacking the Blake pattern by Mingo & Grace. 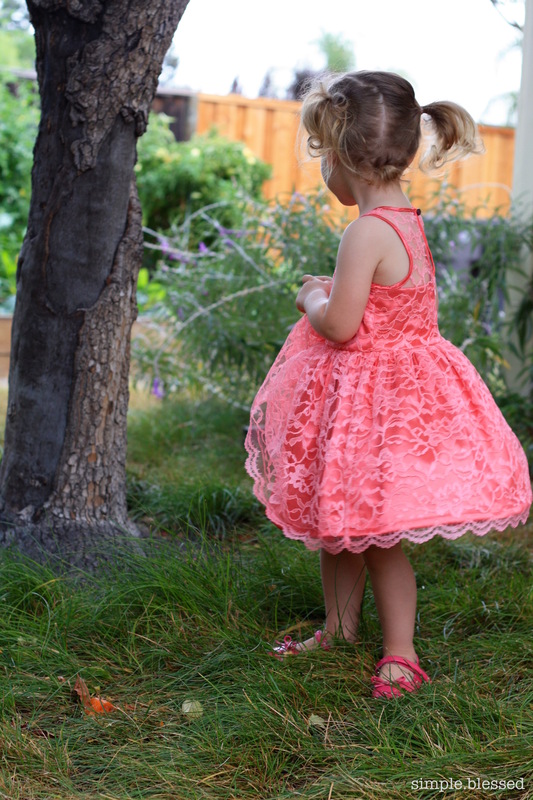 This is the same pattern that I used for Ella’s two-year picture dress, and it’s one of my favorites. For the skirt, I skipped the side seam pockets and gathered instead of pleating it. I also included a layer of tulle in between the lining and the satin top layer, just to give it a little more fullness. I also made sure the lace top layer was long enough that the scallop detail fell below the hem of the other layers. The top took a little more effort. I drafted a sweetheart neckline for the lining and top satin (it’s not real satin, by the way) and only cut the lace layer per the pattern’s bodice piece, but without the seam allowances on the neckline and arm holes because I knew I would be binding the edges instead of having a lining for the lace part. 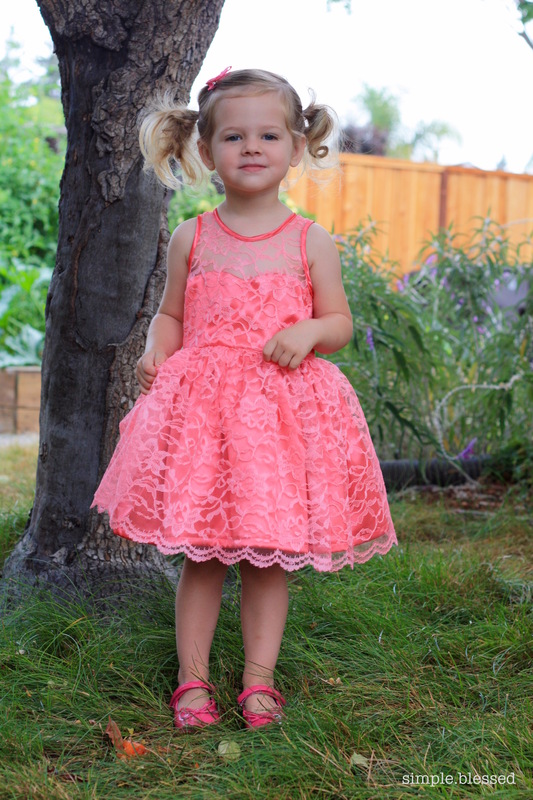 Oh, and all of the fabrics for this were from my local Joann Fabric – I was actually pretty impressed with their lace selection, and I plan to buy the fabric for the real dresses from there too. Thanks for reading! 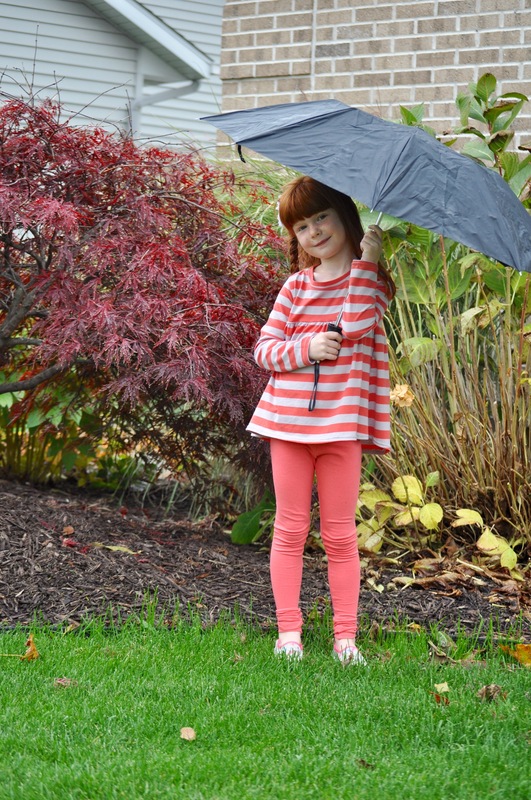 Kids Clothes Week – Fall 2015 – Results! 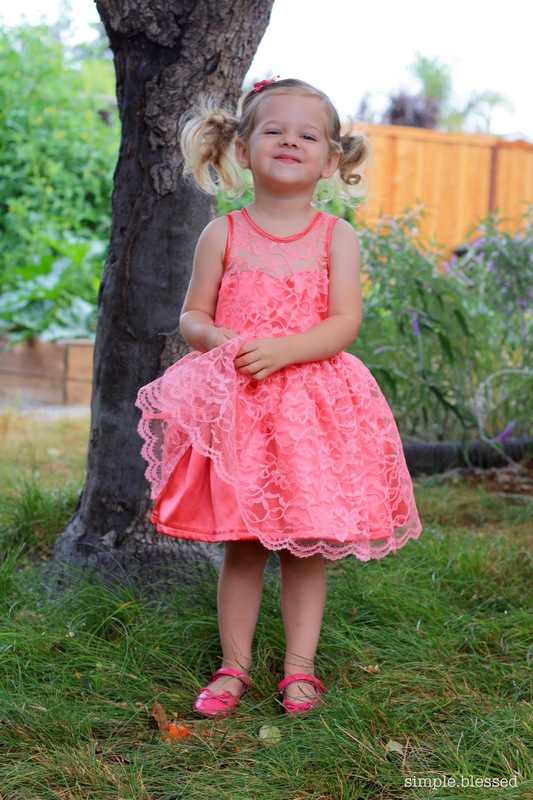 Remember two weeks ago during kids clothes week when I kept posting pictures on Instagram and Facebook of the clothes I was making each day, and secretly crossing my fingers that they would fit my niece who lives over 2,000 miles away??? Well, the clothes made it to Michigan, and the results are in! I made all of the leggings with a size 4 width and size 6 length, and I probably should have just gone with a size 5 all around, since they’re all pretty long and skinny. But since this girl tends to grow up more than out, I think it’ll be okay. This first top is a Nessie Top by Craftiness is Not Optional, and it’s the most basic variation. I made a size 3T width but graded out to a 4 height at the shoulder and a 7 length so that it was more like a tunic. I love how the curved hem covers her in the back. 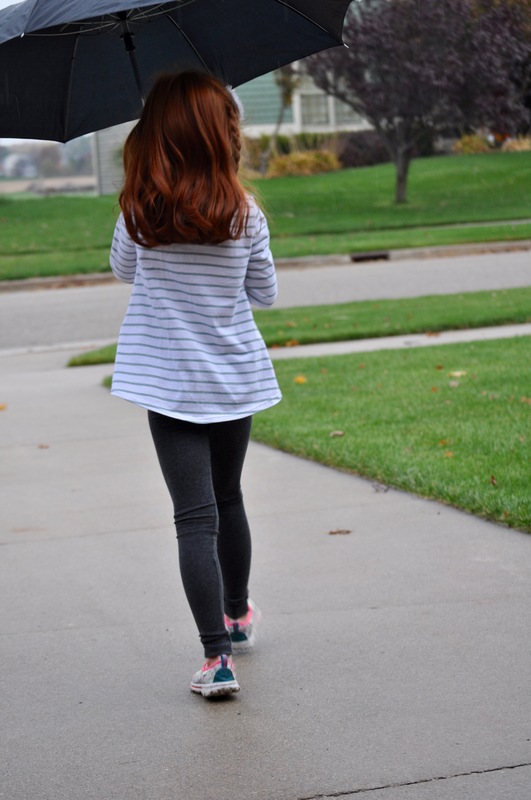 The dark gray leggings were made using the Love Notions Leggin’s pattern. This next top is also a Nessie, but the colorblocked version. 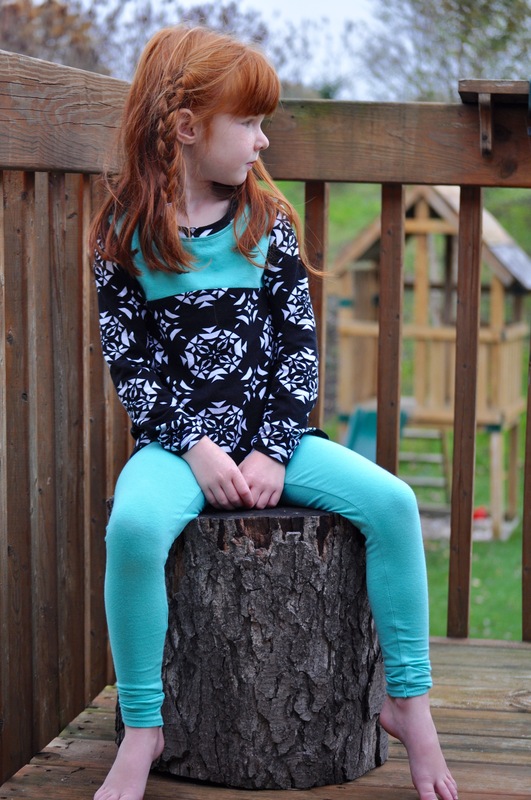 The aqua leggings are Bonny Leggings by Made for Mermaids. This top is also a Nessie Top, but I followed Jess’ gathered pattern hack for some extra variety. These are also Love Notions Leggin’s, but with the yoga waistband instead of the elastic. You can see how the 4T waist looks like it’s actually the correct size, but I probably should have graded out to a wider leg size. Up next was a Pretty in Peplum by Sew Much Ado. I love how this one looks on her! 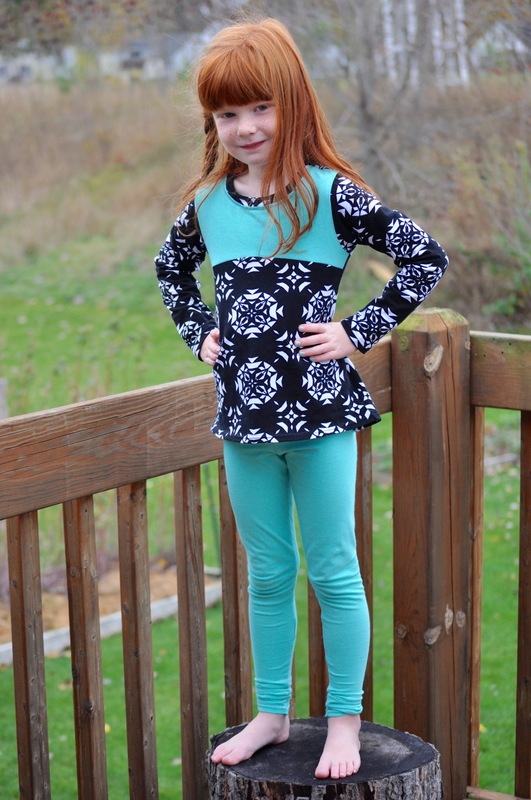 I did a 4T width and a 6 length for the main part of the shirt, and then for the peplum I did a 4T width and a 12 length to make the skirt part extra long. I also did the size 4 sleeves, but added some length based on Lexi’s arm measurement. The pink leggings are Bonny Leggings, just like the aqua ones. See how the top gathers a bit at the sides? I’m not a huge fan of how these ended up fitting her. 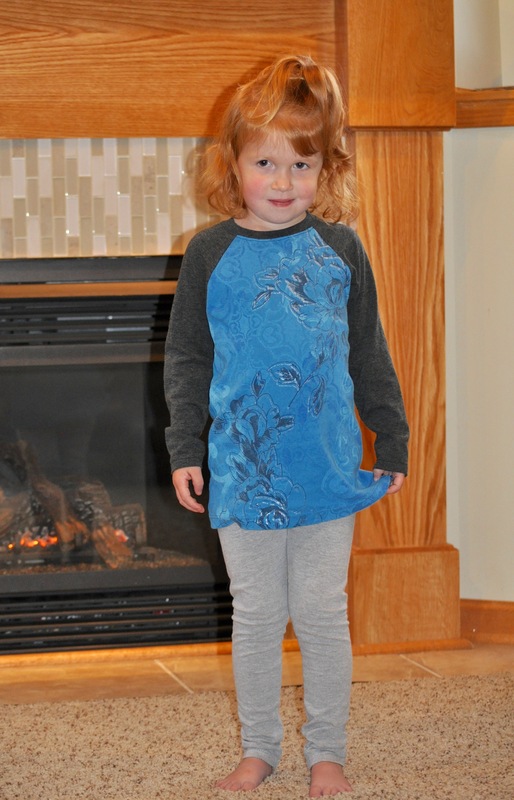 And last but not least, a Recess Raglan by See Kate Sew and a pair of black Go To Leggings. I love this one on her too! I made a size 4, but added length and flared it out a bit for more of a tunic look. I also did just a basic sleeve with a hemmed end, which isn’t one of the pattern options. I just decided on a sleeve length based on her measurements. 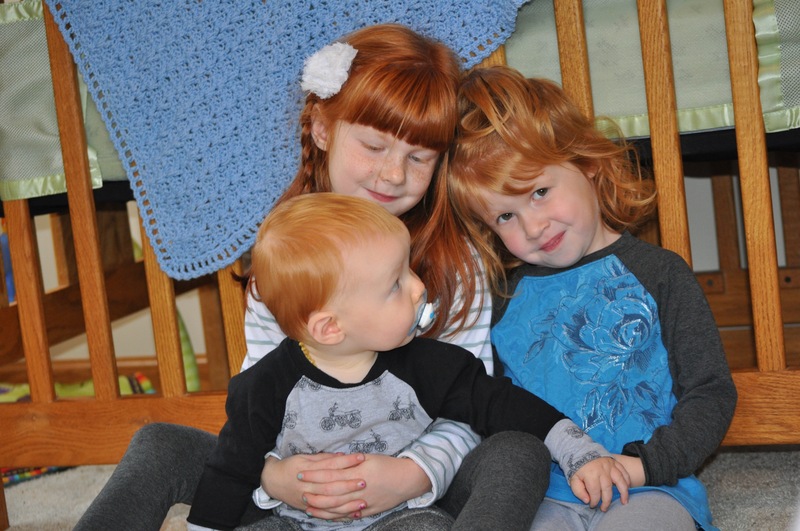 This was my first time making a Recess Raglan (I picked up the pattern a few weeks ago when there was a sale! ), and I LOVE making these shirts. 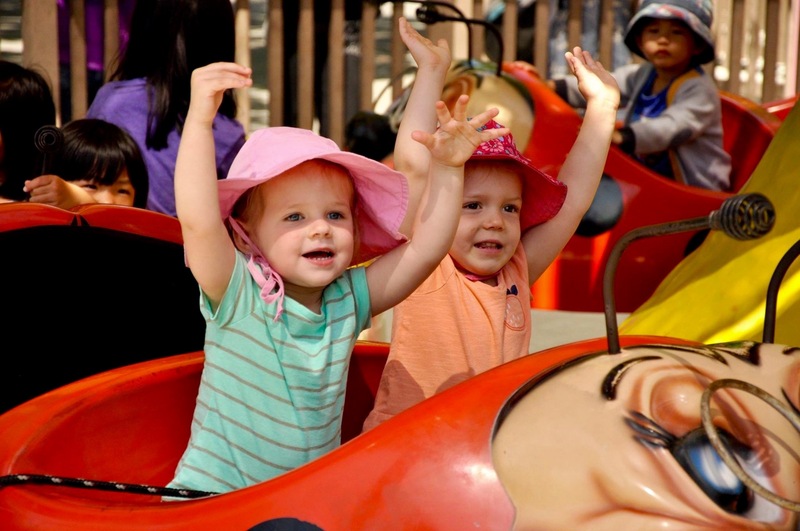 They come together so quickly and are adorable on kids. In fact, Lexi’s came together so quickly that I had time to make one for each of her little siblings! 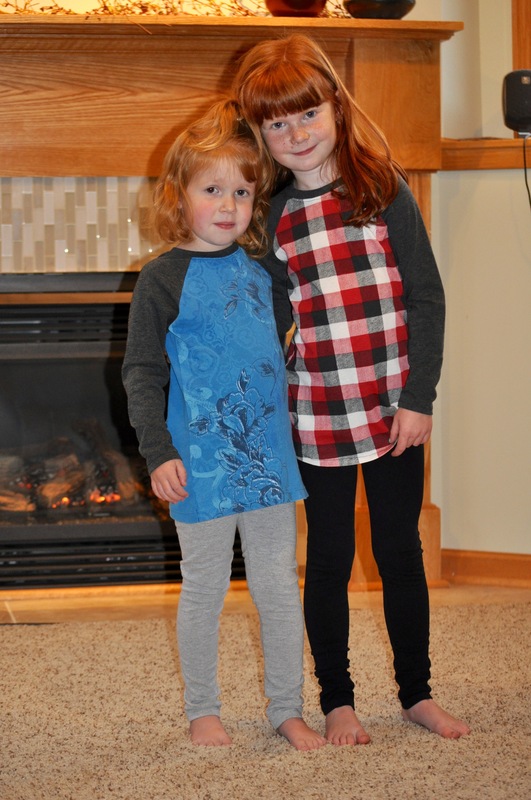 The shirt I made for Chloe was upcycled from a shirt my mom had given me a year ago, which meant that I could use the existing hem… extra fast and easy! She also got a pair of Go To Leggings. And look at these two sisters… I mean… wow! Aren’t they beautiful?!? Nolan got his own Recess Raglan in a straight-up size 18 months, and this one has the cuffed sleeves that the pattern calls for. I can’t believe this cutie pie is almost 9 months old already!!! 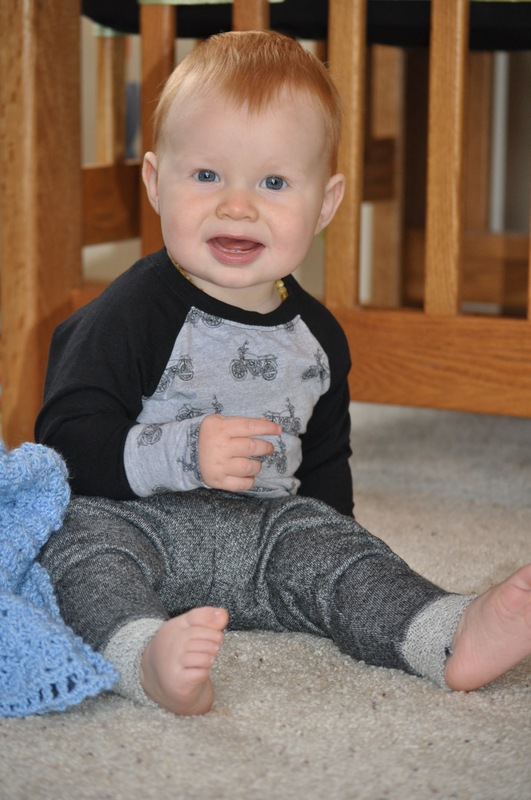 He also got some Go To Leggings, but I modified them a bit – I cut the size 2T width so they wouldn’t fit as much like leggings, and then cut them at the 12 month length and added a cuff. These were made out of french terry, so they’re super soft and cozy. The cuff is the same fabric, but inside out. I love the look of these and I have plans to make multiple pairs for Luke. You also get a glimpse of my gorgeous sister in this pic. It’s no wonder her kids are so cute! I bought all of the fabrics (except the french terry and the upcycled shirt) from Girl Charlee, and they were all great to work with. I love that the fabric weights are listed on their website, since I still consider myself a novice when it comes to sewing knits, and the heavier weights are more stable and easier for me to work with.